It is no surprise to say that water is an integral part of the hydration process of concrete. However, allowing excess moisture to leave the slab once it is poured is just as crucial to a flooring installation. Once the slab is poured, the excess moisture must leave the slab in order to strengthen the concrete bond and to permit successful flooring installations. Moisture-related damage to flooring materials is, of course, possible, but the real risk to a successful floor lies between the concrete slab and the flooring itself. Three common floor materials run the risk of moisture-related problems. Moisture-related adhesive failures have always been a problematic reality in the flooring business. In addition, with recent trends towards restricting volatile organic compounds (VOCs) in flooring adhesives, there has also been an increase in the number of moisture-sensitive adhesives in use. If the adhesive being used to install the flooring does not have the correct moisture tolerance for the concrete subfloor, the entire installation can be at risk. The attraction of floating floor systems is that they do not need to be attached directly to a subfloor. Instead, the floor pieces “lock” together to become a cohesive unit that is not as subjected to seasonal shifts, dimensional challenges or other moisture-related issues. In fact, floating floors are often the recommended product of choice for floors where high moisture situations may present issues with standard attached floor systems. For these floors, manufacturers often recommend the installation of a moisture barrier between the subfloor and the floating floor to prevent moisture intrusion. The difficulty, of course, is that if that barrier is compromised in any way, moisture from the slab beneath can still damage the flooring or finish. Excess moisture issues in a grouted tile or mosaic floor will often appear as efflorescence, a whitish residue on the surface of the grout. It’s the result of water-soluble minerals being dissolved by the moisture within the slab and being transported to the surface of the grout where the moisture evaporates away, leaving the minerals as a visible residue. The more porous the concrete or the grout, the more likely efflorescence will appear. In the majority of cases, these minerals are actually part of the concrete slab mixture (or possibly in the ground beneath the slab, if no moisture barrier was installed). If the slab was not effectively dried before the tile was installed, the natural moisture migration of the drying concrete will impact the grout, and remediation steps will be necessary to correct the problem. In extreme cases, excess moisture can lead to flaking or chipping of the grout and a complete grout or thin-set failure. Are you seeing a theme yet? Moisture control is often one of the most crucial, yet most overlooked, elements of any floor’s success over time, and that means accurate moisture measurement, beginning at the slab. 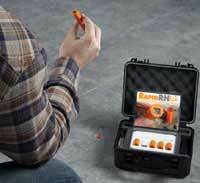 Accurate concrete moisture measurement is best achieved with relative humidity (RH) testing. Unlike surface-based tests like calcium chloride tests, RH testing determines the accurate moisture condition within the slab by placing probes at a strategic and proven depth. Moisture often rises through a slab from the bottom to the top in the drying process, so only testing performed at the correct depth can let you determine if the final moisture condition of the slab will be compatible with the flooring and the products used to install it. 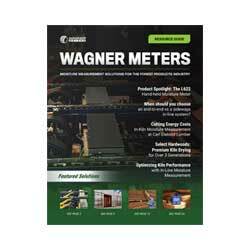 Because we at Wagner Meters have been assisting flooring professionals for over 40 years, we have also designed some of the most accurate and innovative testing methods on the market today. Our Rapid RH® is based on decades of scientific research and technological advances to help each builder and flooring specialist accurately determine the correct concrete RH level for his or her chosen flooring and products. Our innovative Easy Reader™ and factory-calibrated Smart Sensor design mean that results are quick, simple and reliable. The Rapid RH® line of products is affordable and conforms to ASTM F2170 requirements for easy recording and reporting. We also understand that sometimes a building project schedule means making alternate choices in adhesives or even flooring products, and the Rapid RH® can help you make informed decisions. Along with accurate, actionable testing, we’ve also compiled a one-stop list of manufacturers that provide an RH tolerance for their flooring products at www.rhspec.com. The truest way to protect a floor system is to be sure that all components are safe from excess moisture intrusion from any source. The Rapid RH® helps you be sure that your concrete slab will not be the source of a moisture-related flooring adhesive or grout failure. Don’t let moisture problems come between you and a successful flooring installation. I am pretty sure that this old home does not have a vapor barrier. If I had a hunch you probably see more “wet” concrete during the wet months when compared to the dry months. I say this because your concrete slab is like a sponge and it will soak up moisture when it is present. One of the ways to outsmart this problem is to create a “vapor” barrier on the surface of the slab. Epoxy Resins are applied to the surface to keep the moisture from escaping from the surface. If done correctly, the epoxy resin should create a barrier strong enough to defend “moisture”. Let me know if you would like some more information or you can give us a call at 800-634-9961. Would this be a foundation issue or the floor not being put down correctly? Thanks for the comment. It would be best to have someone look at your issue because it could be multiple things. I would contact NWFA.org and get one of their qualified inspectors to come out and take a look. it was a shadow but with closer inspection the tiles are turning a dark grey. WHAT would cause this to happen??? Dawn, overnight like that, being honest, I don’t know. I would contact a local contractor whom specializes in tile and/or contact National Tile Contractors Association (http://www.tile-assn.com/) and see if possibly they have any recommendations of someone who can take a look at it. Today we had a home inspection and during the inspection of this home we are interested in purchasing was built in 2010. The garage show efflorescence on the bottom concrete blocks around the garage foundation slab on some of the cement whitish residue on the surface. The home was built on a raise slab. We are not sure if we should purchase home ? If the would be a problem in the future ? What type of repaired is needed and the cost if all. Currently considering purchase but not sure if this is a major problem or could be a problem in unseen surfaces of the home. Please help or advise . Thanks for the comment. I would recommend contacting a waterproofing contractor and see if it is a big issue. In general, this is a fairly common occurrence, but you should verify your specific situation. Hello, we’ve been dealing with a moisture problems since we installed porcelain tiles in five rooms in our home built in 1989 (the rest of the house has ceramic tile that has been in place for 15 years). We had a drainage problem on one side of the house that resulted in wet walls (interior, not exterior) as well as major efflorescence in the new tile installation. We are currently in the process of installing well pointing and a sump pump to drain water away from the house. We are located in FL, and it’s raining every day here, and in on the rooms you can actually see water beading through the grout lines, but only in the middle of the room. We’re hoping draining water away from the house will ultimately dry out the slab. After reading the posts above, it seems the tile installer should have put down an epoxy resin before setting the tile. Is there any way we can do something to the EXISTING installation, and not have to resort to removing all the tile and starting over? Could we regrout and add something to the grout mix to help with the waterproofing? My wife and I purchased engineered floors for our home, which is on a concrete slab. They were initially installed floating with a 3mm underlayment. Unfortunately, the slab was not leveled properly, which led to a number of dead spots and possibly buckling. So, the floors are being redone and the slab is being properly leveled. My questions are… I am concerned with moisture as the home has previously had moisture and mold issues. What is the best glue to provide a solid moisture barrier between the slab and the wood and/or do I still need an additional underlayment between the slab and wood in addition the glue (my contractor says no)? Thank you. Thanks for the comment. Your best place to start for best installation practices for wood is the NWFA at http://www.nwfa.org. They have resources and phone numbers you can call to get expert advice. Regarding adhesives, you need to have appropriate moisture testing of the concrete to know what needs to be done to remedy the problem. I would start there and then based on the moisture testing results, you can shop for appropriate products to go on top of the slab. We have fully renovated our house this year. One of the major jobs was to put marble (Crema Marfel) on the floor. The floor was laid in February 2017. Two months later, we noticed powder like substance appear on the surface. We pointed this out to the contractor, who arranged for a chemical to be applied and buffing carried out. After the buffing, the the floor appeared clean and shiny. Two months later the problem appeared again. The contractor has arranged the application of chemical and buffing three times but each time the problem reappears after 3-4 weeks. We are now noticing dark stain marks on the joints. We moved into our house in March 2017, but have not been able to settle down because of the floor problem. Can you help with identifying the cause of the problem and proposing a solution. I would recommend you search this organization https://www.nicfi.org/search.aspx for an inspector that can give you an independent evaluation of the problem and potential resolution options. Hello Jason, any thoughts regarding my post dated June 16? We hired a geo Engineer who determined that we don’t have a high water table, however there may be have been a drainage issue, as the soil samples indicates that one side of the house is about a foot wet. Likely soils holding water. Somehow it’s seeping into the area of dirt BETWEEN the slab and footer and has been wetting the soils under our floor. And we contacted the tile manufacturer; it seems the porcelain tile is creating condensation and it’s finding its way through the grout and our walls. We’re trying to figure out if there’s a way to dry the slab without having to rip out all of the tile. First, I apologize for missing the original question. I am not aware of being able to “fix” this problem without starting over. That being said, it may be beneficial to have a tile certified flooring inspector come out and evaluate and give some advice. I would start here (https://www.nicfi.org/) and see what this organization can do to help. I had a bamboo wood floor laid that did not adhere to the glue, the home flooded over a year and a half ago , is there anything I can do to save my floor. Thanks for the comment. I would recommend having either a qualified wood flooring installer or a wood flooring inspectors come out and evaluate the floor to determine a course of action. I have lived in my apartment for about 10 years and recently an accidental water problem in the apartment upstairs caused some damage to my ceiling and kitchen floor. Management said my carpet was not damaged so did not need replacing. However, when I walk barefooted across the living and dining area which are carpeted the bottom of my feet feel dampness. Is there some way to determine if there is still moisture under my carpet? Thanks for the comment. There really isn’t a way, that I am aware, to test moisture in the carpet itself. One thing you may want to try though would be a visual test. Take some newspapers or paper towels and put them in a few areas, placing something on top of them to weight them down. Leave them for short period of time and see if the paper product shows any discoloration. Obviously, this doesn’t prove where the moisture came from, but it does show moisture. I live in north Tampa. I have battled water intrusion up through my grout lines in my newly installed porcelain tiles for over a year now. It occurs almost daily, pooling puddles, and a couple of times actually squirted through an opening when I scraped the efflorescence away. My home was built in 1980. When we first noticed the issue, end of 2015/early 2016, we saw water stain under our laminate floors. We filed an insurance claim and their investigation (sub-par at best) was negative for leaks and determined to be a ground water/seepage issue, which is not covered. It was denied. I remodeled my home and during the process of removing the damaged laminate, there was thick mold found underneath every sq inch. My kitchen cabinets base and my two bathrooms show water damage and were installed directly onto the slab, NOT the tile. There were 14×14 inch ceramic tile with a ¼ inch grout lines in the rest of the home, which never showed water or efflorescence. Even the un-remodeled bathrooms to this day do not show water intrusion. I installed 36 x 8 inch porcelain tiles with 1/8-1/16 inch grout lines. Well, I am positive that it is NOT a ground water issue through my own long term investigation by many different means, i.e. new gutters, surface ground drains, multiple drilled holes all the way through my slab with no signs of moisture, 5 holes- 4 ft deep, surrounding my slab on the affecting side of the house with NO ground water layers, new a/c return vent, correcting a negative air pressure issue within the home, and more. Im even having a couple tiles de-bonding. I also have a thinner, more powdery textured efflorescence showing on my garage floor and the paint has been flaking off. Over time, the leak locations have been slowly migrating further and further. The water is only on the surface of my slab. I haven’t noticed the slab insides being moist when drilling, or even in the dirt under the slab. I will add that I am on a pond, but it is approximately 40-50 feet behind my house with a major slope, approximately 3 feet lower elevation than my home. I have ruled out just about everything after 3 negative leak detections (1 included a drain inspection), 2 denied insurance claims, 3 geotechnical engineering firms blew me off (couldn’t figure it out and gave up), a building scientist unable to figure it out after almost 8 months trying, ruled out ground water, and more. This problem was consistent even during the 3 month drought we recently had. During this drought, the pond behind my home dropped about 12 inches in water level, but my water instruction continued just the same. The county water department and utilities departments both deny any possibilities of leaky pipes/drains on their end. Heavy rains do not seem to affect the frequency, nor does an extended time without rain. It’s major hydrostatic pressure and NO ONE is able to determine or even guess what the source is. I find it very hard to believe it would be condensation being as there was a couple instances where it showed pressure when coming through the grout. I occur on two opposite ends of my home, but not in the center area. I have even drilled holes through my slab, down into the earth and NO water showing in three different locations drilled. I cannot accept that NO ONE can determine a source for this water. None of my neighbors have noticed a similar problem, however, in the neighborhood due north of me, 3 or 4 homes have seen similar issues, just not nearly as severe. I have held off on installing major, overkill French drains around the perimeter of my foundation until I can define the source. Is it possible that it’s a newly exposed underground spring???? I am willing to bet this would be your most challenging investigation yet, if you are able to help me out. Please text or email me anytime. The sooner the better. I will not stop trying until I solve this. Thanks for the comment. I will contact you directly. Thanks for the comment. I would enlist a reputable flooring contractor to give you options. If the levels of moisture are very high in the concrete, there are various products on the market that can be applied to the surface (moisture mitigation product), to minimize how much comes out and can affect the flooring finish you wish to apply. Keep in mind, the high levels of moisture don’t bother the concrete, they bother the finish trying to be applied. I hope this helps. We have a luxury vinyl plank flooring and just months later the flooring is bubbled and glue squirts out anytime you step near a seam. These were professionally installed and were glued directly to a concrete subfloor. The flooring company insists I have a leak and won’t repair, but they also never completed a moisture test prior to installing. Do they have any obligation to repair? Thanks for the comment and I am sorry for your issues. 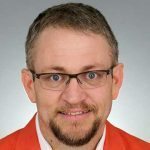 Most contractors have some kind of warranty on workmanship, but in the end, they have the ability to decide whether this falls under their warranty. Depending on where you purchased the material, you might get some help from them, or possibly even the manufacturer of the product. Good Luck. We finished our basement two years ago and chose a vinyl tile with grout for the bathroom. Less than a year after, some of the tiles buckled up at the grout line and were replaced by the flooring people, the thought was there was not enough glue. Into the second year more tiles did the same and the flooring people said there is a moisture problem. Not all tiles are buckling, so upon recommendation we removed the toilet thinking it may have a leak. The seal was good, so that was not the problem. The contractor did need to break the slab to rough in the drain for the toilet and shower. We have not removed the flooring to see if there is an issue with that. The floor outside the bathroom walls is either carpet or bare concrete, neither have moisture. Another part of the basement we have a vinyl floor product that interlocks without grout, not sure if it was glued, with no issues. The basement has always been dry before and we have always run a dehumidifier. The current thought is to remove the flooring and let it dry to see where the moisture is now. I’d like to know what we need too look for, and correct as a next step. Thanks for the comment. First, I would want to test the concrete to see how high the relative humidity is in the affected area, Second, the areas that you state don’t have a moisture issue, may. Carpet is very breathable and, obviously, so is bare concrete. The moisture we are speaking of here is moisture vapor, not physical water. So it may be coming up through the concrete and once it gets to the surface, it evaporates and is processed through the dehumidifier. One of the big issues with basement renovations is you never know if there is an intact vapor retarder under the slab and in most older homes there isn’t. Without that, moisture from the soil is always available to the concrete. They make products that can be applied to the surface of the concrete, prior to flooring installation, that help minimize the amount of moisture that can come out of the slab. The first thing is to determine how bad the problem is. 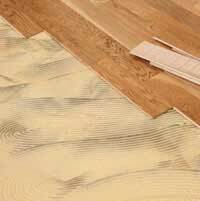 My husband and I are currently building a house and we’re hoping to use vinyl flooring for a budget friendly flooring. We had a friend/contractor to suggest doing a moisture test before purchasing any flooring. The first test (in Nov) it said there was over 7lbs in the floor. We did another last week and it is down to 6lbs, but according to our friend, that is still too high for VCT. The business we were going to purchase from is supposedly unaware of any need for a moisture test, and says it will be fine. Do you have any thoughts/opinions on this? Or know of any effective ways to draw moisture out of a concrete slab? Thanks for the comment. There are some adhesives that may allow VCT to go to a higher moisture limit. I would consult the VCT manufacturer and seek recommendations from them. Drying concrete is a matter of time and environmental conditions. Having HVAC units up and running is step number one to expedite the process. Good luck. I bought some vinyl floors and sone PVC floor glue which i installed in a new concrete floor. 2 days after, a whitish liquid was coming out from the floor where i installed the vinyl floors. I removed the entire floor and installed brand new vinyl floors again and the same thing happened. Please what is the solution to this? Is it the glue or is it the moist from the new concrete floor? How do I solve this??? Thanks for the question. The first thing to do is identify what the flooring and adhesive manufacturer recommend for proper installation of their product. In their installation documents, they will have requirements for what they call “sub floor preparation”. Here they discuss many things, but one is concrete moisture testing. Have you done any of this? If not, I would start there and then once you have that information, contact the manufacturers and ask for their recommendations on a proper installation. Contractors say the moisture levels are too high to install wood floors. We’ve tried fans, dehumidifiers, calcium chloride test, and had plumbers come out to check for leaks. Any other options so that I can get floors installed and my house back in order? Thanks for the comment. Without knowing the history of the home i.e. old vs new, is this just a renovation or was there a catastrophic event that caused the need for the flooring change (flood), I would recommend having a discussion with the contractor about options. They make products that will encapsulate the moisture in the slab and allow installation or better adhesives, depending on the level of moisture, that can do the same. The will cost more, but help with your issue. Good luck. I have a concrete floor with 24×24 rubber tiles installed on it that is “curling” at the edges of the tiles. When I pull the tiles back, the slab is damp to the touch and you can watch it dry out (color change) once the slab is exposed. However, when I ran a calcium chloride test, it came back 4.6, which should be ok for the adhesive. Any thoughts as to what I am experiencing? Why would a qualitative test “fail” (dampness under the tiles) and a quantitative test “pass”. Thanks for the comment/question. First I would ask, did you grind the 20” X 20” concrete area where you placed the CaCl test to a CSP 1 or CSP 2 and let it sit for 24 hours before setting the test? Second, this is a perfect example of why surface testing isn’t a real indicator of the long-term performance of a floor. The top ¾” of the slab may show “dry”, but once the flooring is installed, moisture deep within the slab will equilibrate, raising the moisture on the surface. is there any regulation/law that sais how high RH in concrete can be before putting tiles/parquete on it? Can you help me with advice somehow? Thanks for the question. This meter isn’t intended to measure RH levels in concrete. From what I have seen, wood floors are usually in that 75% RH range when testing concrete RH% in the concrete, but you should verify with the flooring and setting material manufacturer to make sure. Good luck. Our house is entirely tiled and experienced a major water leak last week which covered most of the floors and flowed out under the front door. While surface water has been cleaned up, our plumber emphasized the importance of finding out what the optimum temperature and A/C setting should be to avoid tenting or buckling of the ceramic tile. Thanks for the question. You may have already seen this article, but if not, here is the link https://cleanfax.com/disaster-restoration/tented-tile/ I would recommend talking with a remediation contractor in your area that may have specific experience on this topic. My guess is reasonable temperature with the addition of some type of dehumidification, if your HVAC isn’t suitably equipped, will be the prescribed method for continuing the drying process. I’m renting and our carpet is on a concrete slab. The carpet always feels wet or damp. How do I go about getting the landlord to take care of this properly? Is there anyone in the city I can contact if the landlord brushes me off? Thanks for the question. If you think it is a health issue then quantifying the issue would seem to be the first step. Air quality testing would seem feasible. Other than that, I really have no other opinions to offer. Good luck. We built a building with a concrete slab. The concrete was poured in August of 2017. We are now trying to figure out how to lay stone on the floor of the shower over the concrete. Do we have to seal the concrete first and then lay the stone and then seal that? or can we just lay the stone right on the unsealed concrete and then seal the stone and grout? Thanks for your help! Thank you for the question. With specific application/installation questions of this nature, I always recommend you contact the manufacture of the products you are going to use to install the stone. Whose thin set? Whose grout? They should be able to give you VERY specific installation instructions to ensure longevity. If you don’t find the information online, call their technical department directly. I hope this helps. we recently installed the vinyl floating flooring over a concrete slab from a previous garage (never used as a garage). the place is a cottage and not occupied during the week. we recently arrived and our temperatures and humidity levels outside were very high and we now have water all over our floors. we’re running a dehumidifier but yikes – what do we do?? Thanks for the question. It’s hard to say if it’s one thing or a combination of things that are causing the issues. First, many garages are built without vapor retarders below them so moisture can potential infiltrate the concrete from the bottom of the slab, migrating to the surface. This may be some of the problem. Additionally, turning off all environmental controls makes perfect sense, from an economical side, when no one is inhabiting the cottage, but it has the potential to cause severe issues to the interior of the cottage. The moisture on the floors may be dew point condensation. If the temperature and relative humidity in the cottage were regulated, this may not be an issue. I hope this helps and good luck. Thanks for the questions. There are mitigation type products that can be applied, topically, to the slab that will lessen the level of moisture that passes through, allowing you to install a finished floor. One issue may be that most will require application directly on top of the slab, not the leveler. I would consult a reputable flooring installer or flooring distribution business for potential recommendations. Good luck. We bought a used manufactured home a year ago and we took up the carpeted flooring this spring. We had installed a laminate locking floor after the carpet was taken up. Now we have a moisture problem. We went back to the people that did the work and they told us to get a dehumidifier, yes it pulls a lot of water out of it, but also the flooring is buckling and it makes creakibng sounds as you walk on it. We went back to the people that installed it and they said they will not come back and touch it until it is fixed. We have had several different people look at it and the last ones told us to keep the vents closed on the west side because a lot of wind and rains come in there. This is summertime and we have had not hardly any winter storms to speak of, but they will be coming because we live roughly a mile from the pacific ocean. I have talked with my neighbors and they do not have this problem as I have told you. Nobody yet has found the culprit and I’m getting more and more worried about this problem, because the fall and winter months are coming. We lived here last winter but then the floor was carpeted and nothing appeared, up until just recently after we had the laminate floor installed. My question is does it need to have a moisture barrier of some sort installed under those laminate planks??? I believe when I seen them being installed there was a light green paper or??? attached to the planks which would be the underside of them. We love the look but so far very unsatisfied with the results of the new floor and we want to know what can be done about it. We had a guy come out to inspect and NO leaks anywhere. But he was unable to see where the problem is. When we bought the house a guy went under the home to inspect and it came out in good shape. Now water——-would a “TRANSITION” help as the people that installed it said it might??? Thanks for the questions. These questions you are asking about installation specifics i.e. moisture barrier under plank and transition strip, should be asked of the manufacturer of the laminate floor. Most have very specific guidelines for approved installations. Most floors of this nature have maximum dimensions before a transition is required to help with potential issues. Good luck. Hi Jason. We bought a two story house three years ago. Six months ago we noticed a bad smell on the entire first floor. We also noticed some black spots through out all th ceiling of th first floor. I started cutting some of these areas of sheetrock and found out that the whole entire first floor ceiling has mold. We had previously removed all the first floor sheetrock, and removed the mold. We had painted the wood with some special paint to prevent this from happening again. We also had installed all new insulation on the first floor ceiling and walls. After we did this, we got rid of all the mold. The smell went away for couple of months. We noticed that the smell came back today. I removed a piece of sheetrock off of the garage ceiling. We then looked from the garage through the inside of the ceiling, towards the connected living room ceiling. When we did this, we found out that there was condensation on the inside of the ceilings again. (The garage and living room.) I also saw some mold on the new sheetrock. I don’t know what to do now. I brought an air condition company to see if that could be related to issues with my AC unit. I thought that maybe there might be too much humidity inside the house. They told me that it was ok. The second story floors, have laminate flooring. When we installed the second story floor, I installed a moisture barrier liner that was recommended by the hardware store where I bought it . Do you have any idea, what could be causing this? We know that the pipe work in the house are good, there are no leaks. That is why, I am wondering what else it could be. We live in the Houston area in Texas.. Thanks for the question. If you have taken out any potential variable for leaks, I would be looking at the potential for dew point issues, especially given you live in a high humidity climate like Houston. Ventilation can be critical in these instances. Make sure your roof has enough ventilation and some people will also install thermostatically controlled gable vents that push and pull hot air once the attic temperature hits a certain level. Doing this may help to diminish the potential for condensation. In the end, having a certified building inspector out there may be a good way to know, for sure, prior to spending additional money on fixes. Good luck. Hi. We are having our hardwood floors replaced throughout the house due to a dishwasher leak that buckled a small area. Our one story house was built in 1959. When we bought it in 2000, we had hardwood floors installed in only a few rooms and tile and carpet in the rest. In 2009 we added on and remodeled the house and added hardwood to all areas other than bedrooms. The company that installed them is a very reputable company and we are using them again for the new floors. When they pulled out the hardwood floors, they did a moisture test and the moisture levels was very high. I am not sure exactly what tests were performed, but the guy mentioned something about a meter and a pin test. They got very high moisture readings in all areas of all rooms of the the original home/slab. Per their recommendation, we are having a plumber come out to do a hydrostatic test to make sure there isn’t a broken pipe in the slab. If there is not a leak then do we just have a high moisture slab? If so, has it probably always been this way? We have never had any problems with the hardwood floors or baseboards before. Do we need to have a barrier put on the floors before putting the wood back down? Thanks for the questions. As you stated early on in your question, you are dealing with an installer that you hold in high regard, so I would follow their and/or the various manufacturer’s suggestions to ensure a warrantable installation. It is common, no matter your locale, to find old slabs that have high levels of moisture. One of the main culprits for this is that IF a vapor retarder was used under the slab originally, it has probably degraded to the point that it is no longer effective, allowing for moisture vapor to move through the soil and into the slab. Even in dry climate areas, moisture vapor is present and can travel a great distance from below. Good luck. Hi we seem to have a moisture problem with our laminate floor, it is laid on a concrete base the base was screed to level the floor and it has been down for about four or five years with no problems but recently we have noticed areas of water appearing on the floor overnight we have a de,humifier that collects quite a drop of water. Any ideas . Mike. uk. Thanks for the question. I would first start by determining if this is a dew point issue. Utilizing a thermo-hygrometer, measure the relative humidity and temperature in the ambient (room) air. Enter those two numbers into a calculator like this http://www.dpcalc.org/ to determine dew point temperature. Next, take the surface temperature of the laminate with an infrared thermometer. At this point, compare the calculated dew point and the temperature of the laminate. The closer they are to each other, the higher the probability that condensation will form. Hope this helps. Good luck. Thanks for the question. Unfortunately, I can’t speak to the installation of insulation, prior to putting down the wood floor on concrete. I would consult a professional installer or contact the National Wood Flooring Association at nfwa.org. Another option you may think about is some type of radiant heat under the floor. Good luck. Thanks for the question. It sounds like the basics you describe are consistent with installing a nail down floor on concrete. As far as the moisture you were feeling, I would talk directly to your installer about that and see what he/she recommends. Good luck. Is it possible for vapor emission to cause water to actually puddle on top of the floor when the floor consists of VCT on a concrete slab? I understand the VCT has been down a couple years with no problems and all of a sudden water started coming out of the joints in the VCT. The slab is probably more than 50 years old and does not have a vapor barrier. Thanks for the question. With no vapor retarder, vapor from the soil has a direct, unobstructed path to the slab. With the addition of moisture into the slab, a pressure differential develops with the ambient air, causing the vapor to want to rise in an effort to equalize the pressure. In these cases, moisture developing at the surface is definitely very probable. Thanks for the comment. 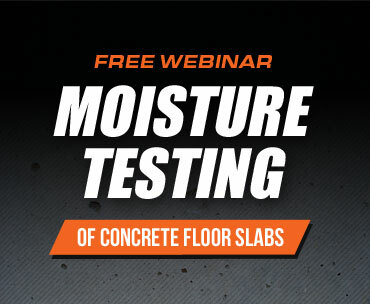 It might be a good idea to sign up for our webinar on concrete moisture https://www.wagnermeters.com/concrete-moisture-test/free-concrete-moisture-webinar/ Lots of good information. Hi Jason! Thank you for offering your guidance! We built our home 6 years ago. It has a concrete slab foundation and sits on a lot that is halfway down a slope, meaning that to the south of us there are homes sitting at a higher elevation, but behind our home the land slopes downward to a valley. We are having problems related to a high moisture level in our slab. The first problem that arose was that our original carpeting, a polyester “green” carpet, looked extremely worn within less than a year of it’s installation. The builder agreed to replace it. We used a nylon carpet and it has been ok. Also, there was cracking on our front patio – the builder agreed to install tile that we purchased to cover the cracks. Our home has mostly engineered wood flooring. The floors started to peel at the edges in the first year we were in the home. We thought it was wear and tear. Over the years this has gotten progressively worse. The wood has a 25 year warranty, so again I contacted the builder. They had a wood flooring specialist from NWFA come out. Using a pin-type wood moisture meter he tested the moisture levels at the surface and slab level. In 2 locations (front and back of house) the surface humidity level came to 9.3 and 9.4%. At the slab level the readings came in at 18% (back of house) and 20.8% (front). They also had a plumber test our lines – they all were fine. The builder declined to replace our floors saying that the slab moisture is high because we added a patio and pool on the back of the house blocking the moisture in the slab from escaping. (The sides and front of the house are not blocked in any way). The slab was not tested for moisture before the wood floors were installed – this builder “never does that”. I am not sure what direction to go at this point. Are there any tests that you would recommend? What do you think our next step should be? Thanks so much for your help with this! Thanks for the questions. First, slab moisture tests are usually a required part of installing a floor based on the manufacturer’s specifications and in order to get a warranty. I would start with having the manufacturer come out and evaluate the claim. Depending on your satisfaction with a remedy after this, you may need to get a geotechnical engineer out to evaluate the claims related to the patio and pool. Good luck. Thanks for the question. It could be possible, but might not be very probable. If you have a concern, you may want to find your own building inspector to come out and evaluate it for you, not the insurance company. This may be the only way for you to be sure. Good luck. Thanks for the questions and I am very sorry about your new house. Unfortunately, the 28-30% isn’t a scale that I am familiar with, nor is it a measurement scale utilized within the floor finishes community when speaking of concrete moisture. The usual scales will either be represented in relative humidity % when measuring in the concrete or in lbs of vapor emission when measuring on the surface of the concrete with a calcium chloride test. Sorry I can’t be more help. We installed a laminate flooring in a bathroom that was part of renovation that finished Spring of last year. We got the flooring from Home Depot. (It had like a rubber layer at the bottom) We just notice some kind of residue coming from underneath one or two of the planks. The residue is coming between two planks and it it’s about 2′-0″ in length and the planks is between the curb of the walk-in shower and toilet. The contractor had put down this light blue paint like thing on the slab before he put down the flooring. Do habe an idea what is happening? What is the residue? and How do we fix the problem. Thanks for the question. I think first of all, since its under 12 months since the floor was installed (usually the warranty period) I would contact Home Depot and have them come out and evaluate the issue. I am wondering if it may be leakage from the shower or toilet or shower. Good luck. Also, this only occurs in our Florida room. And its only started since we replaced the old flooring which was laminate and before that it was carpet. Thanks for the question. I can’t say I have heard a story like this related to tile. I have seen something of this nature on a sports floor. The white spots are probably efflorescence which is salts from the concrete that are transported to the surface via excess moisture. Looking at the age of the home and/or the potential that the sunroom may have been added later, if I had to guess, there probably isn’t an intact vapor retarder under that slab. This would allow moisture to migrate from the soil and into the slab. With the carpet that was originally installed, it would have been very breathable and you may have never noticed an issue. I can’t explain why you wouldn’t have seen it with the laminate. You may want to have a geotechnical engineer come out to investigate. Good luck. Whatever you chose, just verify that it will work against hydrostatic pressure. This may be part, if not all, of the issue.